Herb-Lax is the most effective, gentle colon detox and cleanser on the market today.It contains 9 herbs and is recommended to take before going on a supplement program.By taking Herb-Lax first, the herbs will help to pull the toxins and poisons our of your system. If a laxative is needed, take at night. If a body purifier is needed, take with meal. We shower, brush our teeth and wash our hair on a daily basis. But, we tend to ignore internal cleansing until some form of disease sends us a wake-up call. Well over 90% of degenerative disease conditions can be related directly to intestinal stasis - that is, a stagnant, fermenting condition within the bowels and related organs. A combination of nine different herbs that help cleanse the body through better, more complete elimination. This does not necessarily correspond to actual known constipation. A person can move his bowels many times a day, and still be encumbered with . . .
all of which contribute to the circulation of toxic agents throughout the entire body, giving rise to an endless chain of "disease" conditions. Herbs do not act like ordinary laxatives that irritate the tissues and force the bowel to eject its contents, this process actually weakens the organs and causes dependencies. Herbs, being a natural food, nourish the bowel and related organs to strengthen them so that they will function entirely on their own by effectively eliminating waste materials. A serving size of four tablets will cause a gentle bowel movement within several hours. By taking less than the serving size one can still effectively speed up the flow of food and waste through the intestinal tract without causing diarrhea. Customer Satisfaction ~ Guaranteed to make you "MOVE' or your Money Back! My mother was always having problems with her bowels for years on end; to the point that it was a major concern. We started her on the herb-lax and after 10 years of discomfort, finally she was able to normalize her bowels. The doctor was very surprised at what had happened. He determined that the herbs actually went to work to strengthen and repair the sphincter muscle. Mom can finally lead a normal life. My entire life was troubled with discomfort, I would be bound up with stomach aches and uncomfortable. Because I was like this as a child, the doctor told me this was normal. Well I didn't feel that being in pain, sluggish and uncomfortable was normal. I tried all kinds of laxatives and of course didn't like the forceful urge,.. but at least I could finally eliminate. 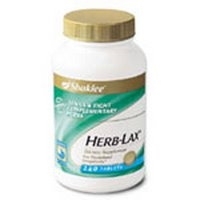 Finally I heard about Shaklee and started using herb-lax. I wish I would have known about it years ago. I will never be without this product, in fact I always order several at a time. It as it has changed my life and I am a much happier and energetic person now that I can get rid of all that sludge. I thought that I was like everybody else. I didn't know you were suppose eliminate your bowels daily. I was having stomach aches and headaches! Whether you want to believe this or not, it doesn't matter. Here's what I know! Once I started taking herb-lax I was eliminating daily, the headaches and stomach aches went away. The way I look at it is that my body was polluted and I wasn't getting rid of the pollution. I am one happy young lady! 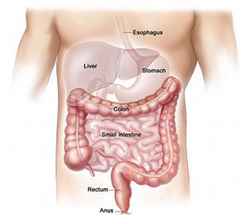 In summary........... remember that your colon knows only to do one thing and that is to absorb. It does not know the difference between good nutrients and toxins , so it will keep reabsorbing good and bad. To avoid body pollution , keep your colon clean and healthy. Remember all disease starts in the colon. So lets keep things moving,........ and in the end..... everything will come out fine!